What is Salt and What Makes Himalayan Salt Superior to Other Types? All salt originally comes from the sea. Why is the sea salty? When rain falls on mountains, it runs through the rocks into rivers and picks up minerals (salt) in small amounts along the way. All these rivers eventually run into the sea depositing the minerals there. Over years and years these small amounts have built up to become sizeable amounts that remain there rendering the sea salty! The water then evaporates from the sea (minus the salt), and falls as rain on the mountains and the whole cycle starts again. When you buy table salt or even sea salt, they are usually taken from salt-beds in the sea but unfortunately have been stripped of all their minerals during processing (some of which are re-added at a later date ie. iodine). In addition, other chemicals are added eg. anti-caking agents, which help the salt flow and not stick together when exposed to moisture. Even if the product is sold as 'crystal sea salt' which is not refined, there are so many pollutants in the sea these days that you may be be getting more than you bargained for! Himalayan salt, on the other hand, and other salts that are mined from deep inside mountains, come from ancient seas that are now long gone following volcanic eruptions. The salt, however, remains deep inside the mountain. These ancient seas, of course, were not polluted and the salts have retained all their untainted natural nutrients. Himalayan salt is a completely natural, pure mineral substance sourced from mines deep inside the Himalayan mountains of Pakistan. The fact that it is unrefined and unprocessed gives it its unique pinkish, crystallised appearance. Not only has this salt avoided all industrial contamination for thousands of years, but unlike common salts, it possesses a full spectrum of 60+ minerals and trace minerals that the body requires for optimal function. One of the main reasons Himalayan salt is classed as the healthiest available is that is contains the full spectrum of essential minerals. 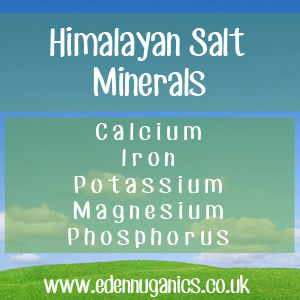 Albeit only in small amounts, every mineral required by the human body can be found in these ancient salt deposits, and therefore, consuming on a daily basis makes a great addition to your weekly diet when looking to reach optimal health. At the very least, it is better than taking regular refined salt. Calcium - Your body needs calcium to build and maintain strong bones. Iron - Helps metabolise proteins and plays a role in the production of haemoglobin and red blood cells. Potassium - plays an important role in electrolyte regulation, nerve function, muscle control, and blood pressure. Magnesium - Magnesium is required for energy production, oxidative phosphorylation, and glycolysis. Phosphorus - About 85% of phosphorus in the body can be found in bones and teeth, but it is also present in cells and tissues. Sodium - Sodium is needed for muscle contractions, nerve transmissions, maintaining pH balance, and hydration. Chloride - Chloride is a type of electrolyte that helps keep a proper balance of body fluids and maintains the body's acid-base balance. Trace minerals - Trace minerals are needed by our bodies, but only in very small amounts. Himalayan salt includes; chromium, platinum, copper, fluoride, selenium, iodine, manganese, molybdenum, selenium and zinc, aluminium, carbon, sulphur and titanium. Himalayan Salt - What Is It and How Does It Work? Detoxifying Your Body - Himalayan salt's impressive mineral profile helps our liver to function at its best. The minerals and negative ions found in this ancient salt easily penetrate the skin, producing a mild cleansing and detoxifying effect that can leave your skin and mind feeling rejuvenated and invigorated. In addition, Himalayan salt can also be used to improve the quality of air in your home. Salt Lamps give off negative ions that bind themselves to positive ions in the air, neutralizing it and ridding it of pollutants. As is so often the case, studies of how the lamps work and their effects are almost non-existent but a quick look at the reviews on a well-known book website, for instance, will tell you all you need to know! Relaxing Your Muscles - Adding Himalayan salt to bath water before a soak is a great way to loosen muscle tension throughout your body. This can be especially useful after physical exercise and other strenuous activities. Once dissolved in water, the magnesium found in Himalayan salt is able to enter our muscles through the pores of our skin, this is known as a transdermal action. The muscle relaxant properties of magnesium are well documented and it is often prescribed in the treatment of cramps and spasms. Stabilising Electrolytes and pH Levels - The word 'ion' refers to electrical charges which we commonly refer to as energy. Our bodies function on energy alone and require a specific mix of electrolytes to maintain this very delicate balance between the intracellular and extracellular environments of our bodies. This is completely vital to our existence. It's the electrolytes that affect and regulate the hydration of the body, blood pH and blood pressure and are crucial for nerve and muscle function. Himalayan crystal salt replenishes electrolytes that are lost during exercise or emotional stress. Electrolytes are electrically charged and therefore play a role in body pH. An excess or lack of certain electrolytes can tip the body's pH balance.